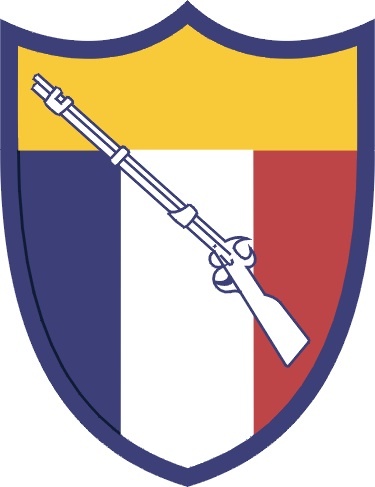 Shoulder sleeve insignia description: On a shield 2 ½-inches in width and 3 ¼-inches in height overall triparted blue, white, and red with a yellow chief, a white long rifle barrel up outlined in blue diagonally from upper to lower right, all within an 1/8-inch blue border. Red, white and blue are our national colors. The color Yellow and the red and blue allude to the combat arms: Armor (Cavalry), Artillery, and Infantry. The long rifle is inseparably associated with the early history of Kentucky prior to and after its admission to the Union as the 15th State. The shoulder sleeve insignia was approved on 30 December 1983. The rifle and powder horn represent the Commonwealth of Kentucky and the Kentucky Army National Guard. The rifle also refers to accuracy and military preparedness. The bridge refers to the engineer's mission and capabilities to overcome all obstacles. The cogwheel refers to mobility, mechanization, and technical expertise of the modern engineer battalion. Thirteen teeth on the wheel recall the original thirteen states of the Union and the principles and ideals that the Battalion upholds and are prepared to defend. MOTTO: "PER EXCELLENTIAM LIBERTAS" (Liberty Through Excellence). Design approved: 26 September 1988.